Four Seasons Maldives Resort at Landaa Giraavaru has opened a brand new Marine Discovery Centre, which has been completely reimagined, restructured and redesigned inside and out. The new interactive state-of-the art tribute to the resort’s ocean conservation initiatives showcases the fish lab, turtle rehabilitation centre, Reefscapers coral rejuvenation programme and the Manta Trust research station – all within one of the most comprehensive oceanic research and education facilities in the Maldives. A darkened spot lit interior gives an underwater feel to the indoor exhibition. Big screens, inspiring touch-activated Prezi presentations, and detailed wall displays cover topics such as drowning islands, coral reefs and fish breeding. In addition, a large (108 cubic feet) aquarium, kids’ touch tank, video wall, naturally styled fish breeding tanks, and portholes into the inner workings of fish lab combine to create a truly immersive experience. Outside, glass fronted turtle tanks enable up close interactions with the inhabitants of the turtle rehabilitation centre. 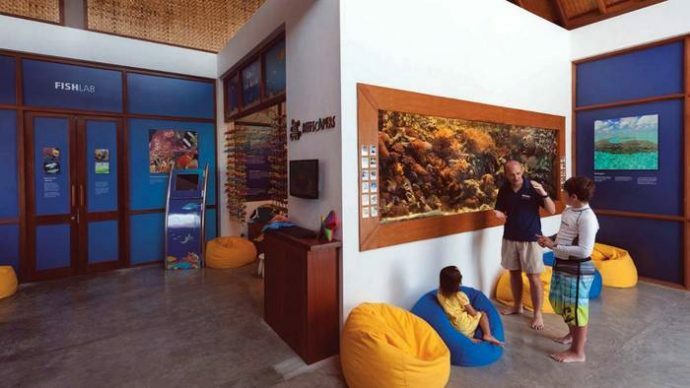 Guests are invited to join orientation sessions or explore the Marine Discovery Centre at their leisure. They can also visit and help care for the injured turtles, assist the Reefscapers project by sponsoring and transplanting their own coral frame, and join a number of fascinating talks and wildlife snorkel safaris. With more than 15 marine scientists and researchers working on conservation projects across the two resorts of Kuda Huraa and Landaa Giraavaru, Four Seasons is at the cutting edge – and caring heart – of ocean safeguarding in the Maldives. Operating under the moniker ‘Marine Savers’, the team’s work extends to year-round research programmes, community outreach projects and guest education. Key achievements include the transplantation of 300,000 coral fragments onto some 5,000 coral frames, the successful breeding of thousands of reef fish, the rescue and successful rehabilitation of 149 sea turtles, mostly injured by drifting ‘ghost’ nets, and the hosting of dozens of local school children on awareness days. Having already collected and analysed thousands of photographs for the national Turtle ID database, the team is now also developing a new Dolphin ID project – using photos of dorsal fins to identify individuals seen regularly in local waters – already with very interesting results. Other ongoing work involves the support of The Manta Trust (the world’s leading manta ray charity), which began life at Landaa Giraavaru over a decade ago. Last year saw two further notable highlights: firstly, the gathering of Maldivian ministers and their counterparts from Bangladesh, Benin, Burkina Faso, Fiji, Mauritania, Senegal and Sri Lanka for a symposium dedicated to the safeguarding of shark and ray populations, and secondly, the ‘Flying Turtles’ project, which made Maldivian and European history with the transfer of four endangered Olive Ridley turtles – deemed ‘non-releasable’ by international standards – to a new forever home at Belgium’s Pairi Daiza Zoo, which is considered to be the finest in Europe. Dubbed the ‘Flying Turtles’, Kerry, Zahiya, La Petite and Peggy were the first live turtles to fly overseas from the Maldives for conservation purposes and the first of their species to take up residence in a European facility. More information and regular updates on the conservation efforts and projects at both Landaa Giraavaru and Kuda Huraa can be seen at the dedicated website www.marinesavers.com. Here, among other things, visitors can see the progress of their sponsored Reefscapers coral frames and catch up on the latest news and photos of the rescue turtles.